There is an increasing demand for healthcare professionals nowadays, making a career in the medical field a good choice. 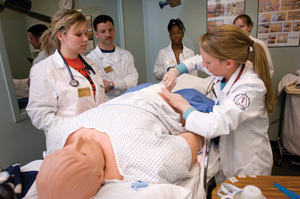 Among the various options in healthcare, a career in nursing is the most popular. As educational programs in nursing vary a great deal, it is often very hard to choose the program that suits your goals, age, experience or financial situation. Broadly, there are three different nursing programs available if you wish to study to be a nurse: a licensed vocational nurse (LVN), an associate degree in nursing, and a bachelor degree in nursing. By far the easiest and quickest route to becoming a nurse is to sign up for a vocational nurse program. This basic nursing career is called a licensed vocational nurse (LVN) in Texas and California, but it is called a licensed practical nurse (LPN) in other states. A vocational nursing program can typically be finished in one year, and this makes it a great choice for those interested in a fast track to a nursing career. Various LVN programs have different entrance requirements- while some programs require the student to have completed courses such as Math, English, and medical terminology; there are others that ask for only a high school diploma and a passing grade in the LVN pre - entrance exam. Having completing the LVN program, graduates will receive a certificate or diploma in vocational (practical) nursing. After this, they are asked to take the National Council Licensure Exam. Candidates who have successfully passed this exam are ready to enter the nursing field at an entry level as an LVN. Licensed vocational nurses can also move ahead in their careers by working toward the Registered Nurse Bridge program. Do remember that most vocational schools do not offer college credits, and hence, if a graduate of a vocational school wants to become a Registered Nurse, they will be required to undertake some more college courses in English, psychology and anatomy. If you wish to transfer credits for the Registered Nursing program, then apply only in those schools where students have transferable credits. The second route into nursing is to undertake an Associates Degree in Nursing. This program usually takes 2 years to complete and has to be approved by the state's Board of Nursing. This program is so much in demand that some community colleges have a two to three year waiting list before one can enter the program. The prerequisites for admission include chemistry, microbiology, psychology, anatomy, college level English and math courses. This course is also available in many private schools, but the cost of the fees in such schools could be as much as five times higher than in community colleges. Lastly, to earn a license as a Registered Nurse, students must pass the National Council Licensure Examination for Registered Nurses (NCLEX). Even though an Associate Degree also permits a student to become a Registered Nurse, the Bachelor of Science Nursing program offers the best career opportunities, and a graduate with a BSN degree can get more rewarding positions in nursing administration, management, or work at an insurance company. Bachelor of Science Nursing programs are typically taken at four year colleges or universities.